Warming Trend Into Sunday - Stormy & Sticky Next Week - Another Way to Discuss a Changing Climate? Yesterday Mark Seeley and I lead a panel on faith-based climate messaging at the National Adaptation Forum in St. Paul. Scientists and thought-leaders representing Christianity, Judaism and Islam agreed that appealing to hearts and minds is critical. A joint statement issued on the role of faith and climate change messaging is below. And don't bury the lead: viable solutions exist today. 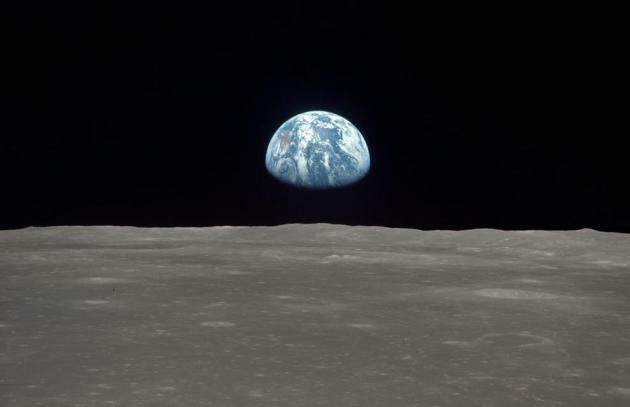 You can club people over the head with the stick of climate gloom and doom, or hold up a carrot of hope: we can have everything we want and need, save money and retool our economy, while emitting less warming carbon pollution. There will be disruption and dislocation, but I'm optimistic we'll figure it out. Because in the end we won't have a choice. Today is Twilight Zone Day, so I'm taking off early to document a 4-day run of warm sunshine. Somebody has to do it. We should hit 70F Friday; 80F is not out of the question by Saturday. A fetch of moisture from the Gulf of Mexico fuels T-storms next week with dew points in the 60s. It's hard to believe, but neighbors will be whining about the humidity in 3 days. Expect a steamy stew next week, with a few thundery lumps every now and then. 2017 National (Climate) Adaptation Panelists focused on faith-based messaging, from left to right: Mark Seeley, Dr. Teddi Potter, Paul Douglas; Mitchell Hescox; Odeh A. Muhawesh; Rabbi Fred Scherlinder. The Jet Stream Is About to Get Weird, Again, and It Could Lead to Extreme Weather. A high amplitude pattern increases the potential for severe outbreaks. Here's an excerpt from MSN.com: "...The atmosphere wants to get out of the traffic jam. It wants to restore forward motion and balance. That’s the whole point of weather — to balance the energy across Earth. So it will begin to produce weird conditions to break the traffic jam and return to its normal and preferred west to east flow. This is where our increased vulnerability for extreme weather events comes from. Floods, severe weather, spring snows and even early season tropical storms are all fair game over the next few weeks. Also troubling is the potential for an increase in this extreme weather pattern as the climate changes. Research published recently in Nature suggests a link between Arctic warming and atmospheric wavenumber-6 patterns. Enhanced warming in the Arctic would lead to a weaker temperature gradient between the tropics and the poles, resulting in more occurrences of a wavy, amplified jet stream capable of producing extreme weather..."
Animation credit: Pivotal Weather. "Ensemble forecast 500mb heights and anomalies through May 14." Another El Nino Brewing for Late 2017? At the rate we're going we may see a perpetual El Nino warm phase in the Pacific. Here's an excerpt from Yale E360: "There is a strong chance for another El Niño in the second half of 2017, bringing with it altered weather patterns across the globe that could include drought in parts of Africa, Asia, and South America, and wet conditions in the southern U.S., forecasts from the National Oceanic and Atmospheric Administration and other organizations warned last week. The new El Niño would start just over a year after the end of one of the world’s strongest El Niños on record. That event, which lasted from 2015 to 2016, increased surface water temperatures in the central Pacific Ocean by as much as 4 degrees Fahrenheit above normal. NOAA scientists did not say how severe the new El Niño could be..."
Image credit: Earth Institute, Columbia University. Slight Severe Risk Today. NOAA SPC has outlined an area from Dallas and Little Rock to St. Louis, Louisville and Charleston, West Virginia. The primary risk is large hail and damaging straight-line winds, but (as always) a few isolated tornadoes can't be ruled out. Adding Atmospheric Insult to Injury. NAM guidance from NOAA shows bands of heavy showers and T-storms tracking across Missouri into the Ohio Valley later today, capable of 1-3" rains. Meanwhile the remarkably wet pattern persists for the Pacific Northwest - where it just does not want to stop raining (or snowing). Seattle just had the coldest winter since 1985. Just when you thought it couldn't get worse. Animation: NOAA and Tropicaltidbits.com. Active Pattern Continues. Some 3-5" rains are predicted for the Pacific Northwest and the Virginias over the next week; more heavy rain (1-3") for flood-ravaged counties in Arkansas and Missouri. The only areas escaping puddles: south Florida and the Desert Southwest. Billion Dollars Worth of Hail Damage in Denver Metro on Monday? It's still early for specifics, but the scope of the hail damage is extensive, according to Capital Weather Gang: "...The Denver Post says the storm brought down power lines and caused car crashes — probably because of slippery conditions. Even in parts of the metro area where the hail was only nickel-sized, it coated the roads in a thick sheet of ice. Depending on the extent of the damage, this could be close to a billion-dollar weather disaster for Colorado. It’s not unheard of for hail storms to cause incredible insurance losses. In April 2017, a hailstorm in San Antonio resulted in $1.4 billion in losses and became the costliest hailstorm in Texas history, unadjusted. Car damage was estimated at $560 million, and damage to homes was around $800 million, according to the insurance council of Texas as reported by the San Antonio Express. More than 110,000 vehicles were damaged by the storm..."
As Heat Index Climbs, Emergency Visits, Deaths Rise in New England. It turns out the Heat Index (temperature + dew point) doesn't have to be as high as thought for people to succumb to the heat. Here's an excerpt from Brown University: "New research shows that New Englanders are susceptible to serious health effects even when the heat index is below 100, a finding that has helped to change the National Weather Service threshold for heat warnings...Data from the study, published in Environmental Research, has helped to shape a new National Weather Service policy for the New England region, according to a recently posted statement from the service’s eastern region headquarters. 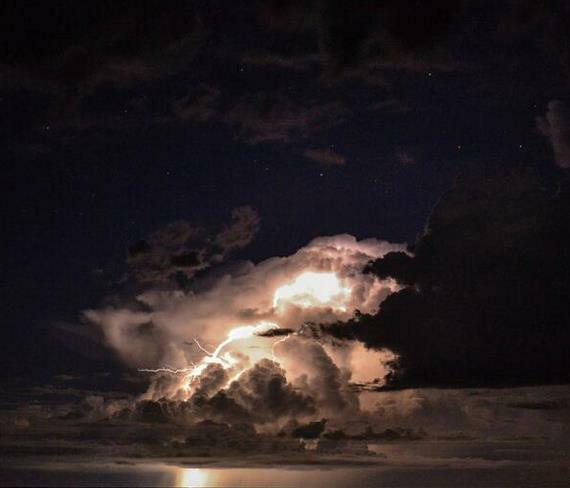 “The old threshold of 100 to 104 degrees Farenheit for two or more consecutive hours has been lowered to 95 to 99 degrees Farenheit occurring for two or more consecutive days, or any duration of heat index 100 to 104 degrees Farenheit,” the statement says..."
Myths and Facts About Lightning. Here's an excerpt from thedenverchannel.com and Fox47news.com: "Each year roughly 300 people, on average, are struck by lightning across the country. Sadly, 30 of those are killed. The odds of being struck are 1 in 13,000 for an average lifespan. 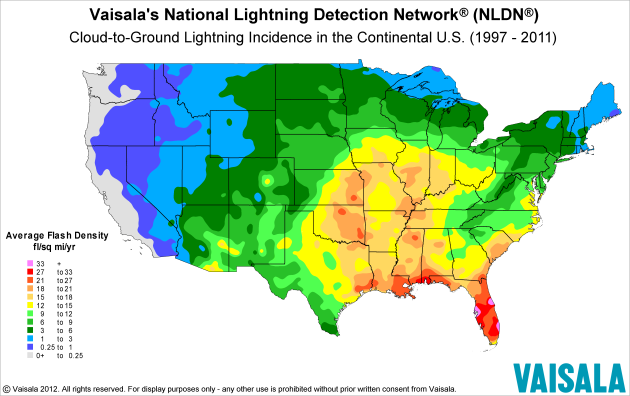 Data compiled by the National Oceanic and Atmospheric Administration shows that over a 10 year period, the Southeast has the most lightning fatalities in the country. Victims can be directly struck by lightning or can be injured/killed by the electrical current from the ground surrounding a nearby strike. A victim doesn't hold onto the current, so it is safe to touch him/her following the hit..."
Lightning Is No Match For This System That Can Predict Bolts Before They Strike. Interesting technology highlighted at Forbes: "...We cannot tell you exactly where a lightning strike will occur,” company president Bob Dugan said over the phone earlier this week, but Thor Guard can tell you when atmospheric conditions within several miles of the sensors are ripe for lightning strikes to occur. When Thor Guard’s sensors indicate that a lightning strike is possible within range, a loud horn and strobe lights alert anyone nearby to seek shelter immediately. The system can work for just one location or include several sensors and remote horns working together to keep watch over large spaces like public parks or entire school districts. Dugan points to the vast array of clients who use Thor Guard's systems to protect their properties as proof that the system works as advertised. The list includes public schools and colleges, numerous airports, the United States Golf Association, several NFL teams, and coming soon, a system that covers 90 golf courses around Chicago, Illinois..."
Swath of States Experiencing Warmest Year to Date. The off-the-charts warmth of February is starting to fade. Here are a couple of clips from a Climate Central recap: "For a swath of states from New Mexico over to Florida and up to Ohio, 2017 has been the hottest year on record through April. For the Lower 48 as a whole, the year is the second warmest in records going back to 1895...Fourteen states along the southern tier of the country and up the Ohio Valley are record hot for the year so far, with another 17 states having a top 5 warmest year through April. Numerous cities in those states, including Atlanta, Washington, D.C., Miami and Charleston, S.C., are also running record hot so far in 2017, according to the Southeast Regional Climate Center. Only the Pacific Northwest had temperatures at or below average for the year..."
Montreal's Historic Flooding. When weather stalls for days or weeks on end, the consequences can be significant. Here's an excerpt from The Atlantic: "Montreal’s mayor has declared a state of emergency and about 1,200 military troops have been deployed to the city after rising floodwater forced people from their homes. The state of emergency will last for 48 hours, though it could be extended because there are several dikes at risk and the rain is not likely to let up soon. The emergency was declared late Sunday night after three dikes gave way in the city’s north and spilled water into the nearby towns. As of Monday morning, about 1,900 homes across 130 surrounding neighborhoods and towns were affected..."
Photo credit: "Canadian soldiers place sandbags outside a home in a flooded residential neighborhood." Christinne Muschi / Reuters. Mississippi River To Reach Flood Stage in Memphis. U.S. News has the story. Here's Where Heavy Rain Is Increasing the Most in U.S. Climate Central reports: "Heavier precipitation is a signature of climate change. For every 1°F of temperature increase, the atmosphere can effectively hold 4 percent more water vapor. So as the world warms from the increase in greenhouse gases, the amount of evaporation also increases from oceans, lakes, rivers, and soils. The extra water vapor is available to produce additional rain and snow, creating an environment ripe for heavy precipitation events which is exactly what we are seeing in the numbers. This week’s analysis, an update from our 2015 Climate Matters, shows an increase in the top 1 percent of daily rainfall events across the vast majority of states in the U.S..."
U.S. Drought at Lowest Level in 17 Years. Now the problem is much of the USA can't turn off the rain. Climate Central reports: "After years of intense, record-setting drought across the U.S., particularly in the Great Plains and California, the country is now experiencing its lowest level of drought in the 17 years since the U.S. Drought Monitor began its weekly updates. Less than 5 percent of the U.S. was in some stage of drought as of May 4, the most recent update, compared to the 65 percent mired in drought in September 2012..."
Map credit: "Drought Has Disappeared from much of the U.S. Left: August 7, 2012. Right: April 25, 2017." Most Backup Cameras Don't Like Bad Weather. Cars.com points out the limitations: "...If only they worked as well in foul winter weather as they do on sunny days. Subzero temperatures can distort the backup camera images shown on dashboard screens or, as some owners report, cause the system to conk out entirely — sometimes just for the first few seconds. It doesn't matter whether it's an Acura, Volvo or any brand in between, owners complain in online forums that their backup cameras suffer winter blues that include blurry, foggy or dark images or faint lines across the dashboard screen during frigid temperatures. Some manufacturers say the cameras can't handle the cold, but a Nissan spokesman said the LCD dashboard screen is to blame..."
Senate Rejects Repeal of Obama Drilling Rule. TheHill has an update: "Three Republicans joined Senate Democrats on Wednesday to reject an effort to overturn an Obama administration rule limiting methane emissions from oil and natural gas drilling. Only 49 senators voted to move forward with debate on legislation to undo the Bureau of Land Management (BLM) rule, short of the 51 votes needed. Republican Sens. Lindsey Graham (S.C.), Susan Collins (Maine) and John McCain (Ariz.) joined all 48 members of the Democratic caucus in rejecting the resolution under the Congressional Review Act (CRA)..."
In Win for Environmentalists, Senate Keeps an Obama-Era Climate Change Rule. Methane is more than 80 times more powerful (in terms of heat-trapping capabilities) than CO2 over the short term. Here's a link to a New York Times story. 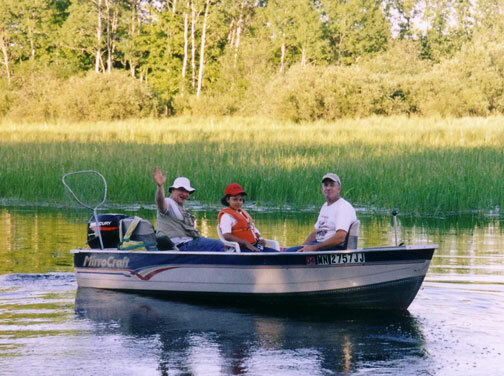 FISH Project That Reduced Mercury Levels in North Shore Women is Expanding Statewide. Go a little easy on the walleye and lake trout if you're pregnant, according to a story at MinnPost: "An initiative to reduce mercury levels among pregnant women living in northeastern Minnesota by getting them to change their fish consumption habits has been effective and is being expanded to include women throughout the state, the Minnesota Department of Health (MDH) announced on Monday. North Shore women who took part in the initiative successfully lowered their mercury levels by being more careful about which types (species) of fish they ate — and how often they ate them. “We don’t want to discourage women from eating fish, but we want to encourage them to eat fish that is low in mercury,” said Pat McCann, a research scientist for MDH, in a phone interview with MinnPost..."
Over 450 million LEDs have been installed to date in the United States, up from less than half a million in 2009, and nearly 70% of Americans have purchased at least one LED bulb. Compact fluorescent lightbulbs (CFLs) are even more common, with 70%+ of households owning some CFLs. All told, energy-efficient lighting now accounts for 80% of all U.S. lighting sales. LEDs use 85 percent less electricity than incandescent bulbs..."
Why Electric Car Early Adopters Went Electric + Best Things About Driving Electric. For me it was the ability to save money (charging at home late at night), lower insurance and MUCH less maintenance. There are 150 moving parts on my Tesla, compared with roughly 10,000 moving parts on a traditional gas-powered vehicle. There is simply less that can go wrong. Here's an excerpt from Clean Technica: "...Environmental benefit” was still the leading response, but the gap narrowed hugely for this question versus the previous one. Drive quality was illuminated as a dramatic benefit of EVs in this section. “The smooth and quiet drive” of EVs and “the fun and/or convenience of instant torque” were in close contention for the #2 spot. However, they both concern drive quality and could have been combined if we chose to go that route. In such a case, “drive quality” may well have risen to #1. The remaining benefits rather evenly split the pie, with some notable differences by region and type of EV, as highlighted in the previous section. However, one more benefit worth pulling out here is “low maintenance.” It didn’t perform well at all in the previous section, but it gets quite a bit of love here — comparable with several other topics, on average..."
Food Waste is The World's Dumbest Environmental Problem. Vox explains why: "...Your dinner isn’t simply a delicious, innocent bystander. From the farm to your plate, there’s food waste at every step. And decomposing food isn’t just stinky; it releases potent greenhouse gases, mostly in the form of methane. Even so, food waste should still be a relatively small issue, except that we needlessly waste food on such a massive scale that it adds up to a global problem. Just under 7 percent of greenhouse gas emissions come from food waste worldwide. To put that in perspective, if all the world’s food waste came together and formed a country, it would be the third-largest emitter of greenhouse gases, behind China and the US..."
Today, Even US Water is Overly Medicated - These Scientists Want to Change That. An interesting article at Ars Technica, here are a couple excerpts: "...The United States of America is a highly medicated country: almost seven in 10 Americans take prescription drugs. That translates to 4.4 billion prescriptions and nearly $310 billion spent on medication in 2015. Painkillers, cholesterol-lowering medications, and antidepressants top the list of drugs most commonly prescribed by doctors...Americans aren’t just putting these drugs into their bodies; they’re also putting more drugs into the environment. A growing body of research suggests all types of drugs, from illegal drugs to antibiotics to hormones, enter the environment through sewage and cesspool systems across the country. And while pharmaceutical drugs—when used as prescribed—are capable of curing disease and alleviating symptoms in people, they can wreak havoc on nature..."
The World's Most Valuable Resource Is No Longer Oil, But Data. Here's a clip from The Economist: "A NEW commodity spawns a lucrative, fast-growing industry, prompting antitrust regulators to step in to restrain those who control its flow. A century ago, the resource in question was oil. 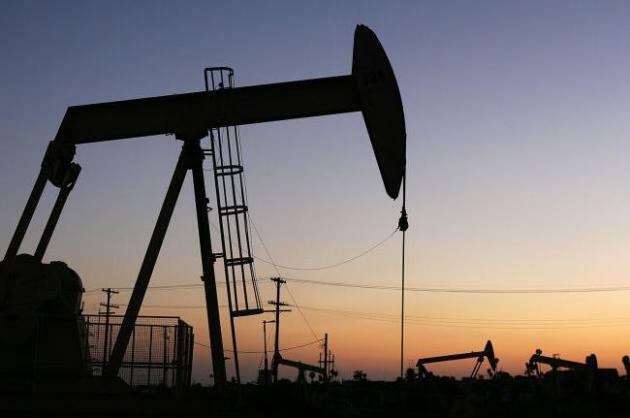 Now similar concerns are being raised by the giants that deal in data, the oil of the digital era. These titans—Alphabet (Google’s parent company), Amazon, Apple, Facebook and Microsoft—look unstoppable. They are the five most valuable listed firms in the world. Their profits are surging: they collectively racked up over $25bn in net profit in the first quarter of 2017. Amazon captures half of all dollars spent online in America. Google and Facebook accounted for almost all the revenue growth in digital advertising in America last year. Such dominance has prompted calls for the tech giants to be broken up, as Standard Oil was in the early 20th century..."
46% of "TV Screen Time" Spent Watching Traditional Linear TV? Netflix, Amazon and Hulu are catching on - getting to be a regular habit according to new research highlighted at iab.com: "...56% of U.S. Adults own a Streaming Enabled TV which is a 56% rise from 2015. The majority of time Americans are watching TV (54%) is spent streaming video (20%), which can include network TV shows, subscription service original shows, or original digital video content. Half of Streaming Enabled TV owners (50%) say they prefer watching commercials over paying for ad-free subscriptions when streaming video on TV..."
The New Hulu Looks A Lot Like the Future of TV. High praise from The Wall Street Journal: "...What Hulu gets right is that the live TV channel is dying—and needs to be replaced by something that looks a lot more like Netflix . Instead of listing what’s on 50 channels, Hulu opens up with a focus on one thing it thinks you’d most like to watch. Flick up for a different recommendation. It makes no distinction between the live big game, stuff from your DVR or on-demand episodes of “The Golden Girls.” Hulu isn’t the only service to recognize we need fewer choices, not more. YouTube TV, the Google live service that launched last month, puts search, trending shows and personalized suggestions front and center..."
Photo credit: "We’re in a TV renaissance, but keeping up is a commitment. The Hulu with Live TV app recognizes we don’t need more choices, just better choices." Photo: Emily Prapuolenis/The Wall Street Journal. 67 F. maximum temperature yesterday in the Twin Cities. 58 F. high on May 10, 2016. May 11, 1915: A waterspout is seen on Lake Mills. * Photo details: I took this in front of the St. Paul Hotel yesterday. Looking good. Historic Flooding in Quebec Probably Linked to Climate Change: Experts. Here's an excerpt from The Montreal Gazette: "Some may blame the gods, Hydro-Québec or their own bad luck, but climate change scientists say the heavy rains and terrible flooding plaguing Quebec this spring are almost certainly caused by global warming. “There is a very clear picture emerging that we’ve changed the chemistry of the atmosphere with our greenhouse gases and we are really seeing the consequences now,” Paul Beckwith, a climate systems scientist who teaches at the University of Ottawa and Carleton University, told the Montreal Gazette in an interview Tuesday. Record amounts of rain this spring in Quebec and Ontario have meant the soil is saturated and can’t absorb any more water. The run-off adds to the water levels in already bloated rivers and streams. Lake Ontario has now hit its highest recorded level since 1880, when record-keeping began. The St. Lawrence River is about 1.2 meters higher than it normally is this time of year..."
Photo credit: "The Montreal region is susceptible to flooding because of its geographical position, immediately below the confluence of the Ottawa River and the St. Lawrence River." Peter McCabe / MONTREAL GAZETTE. These People Want You To Know Climate Change Isn't Just for Liberals. Ars Technica has a very good recap of the pushback on the part of a relatively small (but growing) group of conservative voices speaking out about climate risk: "He doesn’t start with an apocalyptic description of future impacts when he talks to people about climate change, but, for some audiences, University of Wisconsin-Madison Professor of Environmental Studies Calvin DeWitt does turn to the book of Revelation. “I’ll have a white-out pen in my pocket, and I’ll have them read Revelation chapter 11, verse 18. It’s a description of the sounding of the last trumpet, as you hear in Handel’s ‘Messiah,' and the end verse says, ‘The time has come for destroying those who destroy the Earth,’” DeWitt told me. “And so, I say, ‘I have a white-out pen here for anyone who would like to correct their Bible.’” DeWitt sees his faith as fundamental to, rather than in conflict with, his concern about climate change. He often finds common ground with fellow evangelicals by talking about stewardship of the wonderful natural world they have been given as a home. Put in these familiar terms, climate change seems more like an issue worthy of careful consideration..." (Image: Thinkstock). 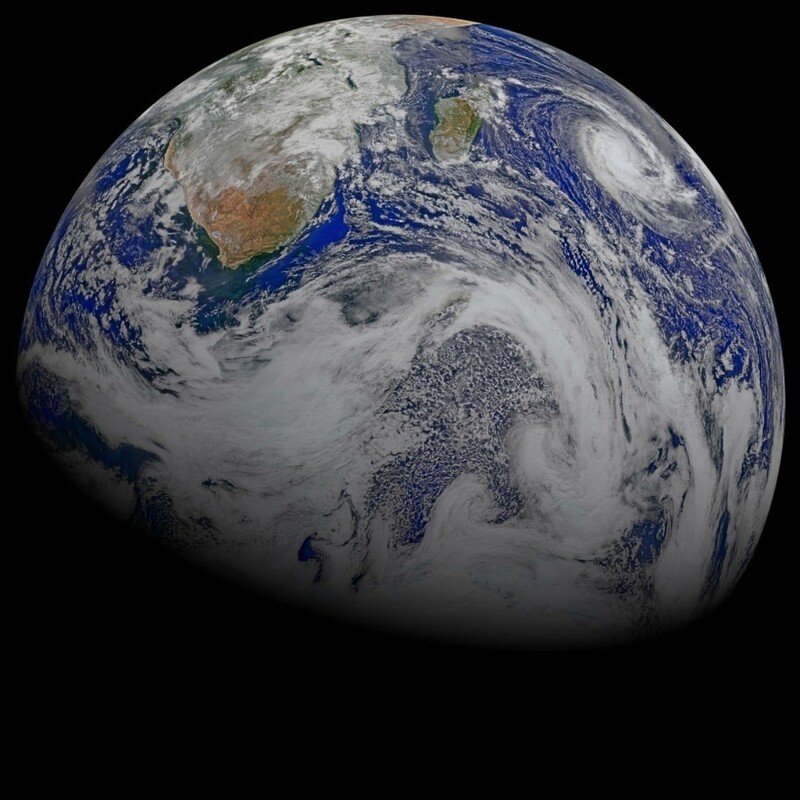 Earth Could Break Through a Major Climate Threshold In The Next 15 Years, Scientists Warn. The Washington Post summarizes new research findings: "Global temperatures could exceed 1.5 degrees Celsius above their preindustrial levels within the next 15 years, according to a new scientific study, crossing the first threshold under the Paris climate agreement and placing the world at a potentially dangerous level of climate change. The report comes as climate agreement participants are watching the United States — where the Trump administration is debating whether to withdraw from the Paris accord — and as scientists with the Intergovernmental Panel on Climate Change are working on a special report about the 1.5-degree goal (equivalent to 2.7 degrees Fahrenheit) and the consequences of overshooting it..." (File image: NASA). Reagan's Secretary of State Pleads for U.S. To Stay in Climate Deal. CNN has the story and video: "...George Shultz -- who served as secretary of state, secretary of labor, treasury secretary and director of the Office of Management and Budget during the Nixon and Reagan presidencies -- lays out the argument in an op-ed published Tuesday in The New York Times with Ted Halstead, president of the Climate Leadership Council. Shultz and Halstead note the "newly invigorated pro-Paris campaign by many of America's top CEOs," citing a series of "public letters and full-page ads." "This is as close as big business gets to a consensus position," they write, arguing that "our companies are best served by a stable and predictable international framework that commits all nations to climate-change mitigation." Shultz and Halstead say that a US withdrawal from the Paris deal would cloud the international business climate..."
Climate Change Denial Rattles Business. Here's a clip from The Washington Post: "...Last November, hundreds of U.S. companies wrote to President Trump. Forbes reported: “More than 300 U.S. companies, including 72 with annual revenues exceeding $100 million, have sent an open letter to President-elect Donald Trump, urging him not to abandon the Paris climate agreement.” This is not just the sentiment of liberals from Silicon Valley, as climate-change deniers would have you believe. (“High-profile organizations signing the letter include Dannon, DuPont, eBay, Gap, General Mills, Hewlett-Packard, Hilton, Intel, Kellogg, Levi Strauss, Mars, Monsanto, Nike, Patagonia, Staples, Starbucks, The Hartford, Tiffany and Vail Resorts — plus many others.”) They have made investments, planned transactions, cultivated public goodwill and done the math. Abandoning climate-change mitigation would be detrimental to their bottom line..."
There Must Be a More Productive Way to Talk About Climate Change. 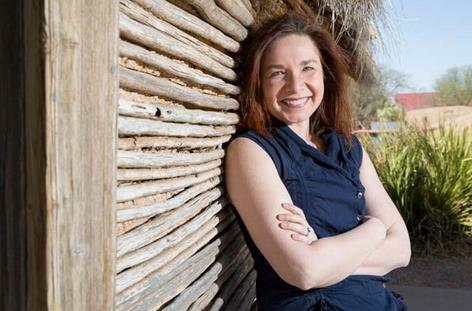 NPR interviews climate scientist and outspoken Christian Katharine Hayhoe: "...Climate denier is a good way to end the conversation. So if our goal is to label and dismiss whoever it is that we are speaking with or to, then that word will do it. What I use instead is a word I think is actually more accurate, as well as having less baggage associated with it, and that is the word dismissive. I use that. It comes from the six Americas of global warming, which separates people into a spectrum of six different groups depending on how they feel about climate change science and solutions. The group starts with people who are alarmed. And then there's people who are concerned. And then those who are cautious, which are actually the biggest group. Then there's people who are disengaged, those who are doubtful. And then at the very end we have about 10 percent of the population who is dismissive..."
The Doomsday Glacier. Alarmist hype? I sure hope so, but there are so many gotchas out there when it comes to climate volatility and disruption. This is a big question mark, highlighted at RollingStone: "In the farthest reaches of Antarctica, a nightmare scenario of crumbling ice – and rapidly rising seas – could spell disaster for a warming planet. Thwaites Glacier in West Antarctica is so remote that only 28 human beings have ever set foot on it. Knut Christianson, a 33-year-old glaciologist at the University of Washington, has been there twice. A few years ago, Christianson and a team of seven scientists traveled more than 1,000 miles from McMurdo Station, the main research base in Antarctica, to spend six weeks on Thwaites, traversing along the flat, featureless prairie of snow and ice in six snowmobiles and two Tucker Sno-Cats..."
Photo credit: "The ice cliffs of West Antarctica." Michael Martin/laif/Redux. The Business Case for the Paris Climate Accord. Here's an excerpt of an Op-Ed at The New York Times: "...In a recent barrage of public letters and full-page ads, Fortune 100 companies are voicing strong support for remaining in the Paris accord. The breadth of this coalition is remarkable: industries from oil and gas to retail, mining, utilities, agriculture, chemicals, information and automotive. This is as close as big business gets to a consensus position. American business leaders understand that remaining in the agreement would spur new investment, strengthen American competitiveness, create jobs, ensure American access to global markets and help reduce future business risks associated with the changing climate. Leaving Paris would yield the opposite..." (File image: NASA). To Curb Climate Change, We Need to Protect and Expand U.S. Forests. Here's an excerpt of an interesting article at The Conversation: "Forests have been removing carbon dioxide from the atmosphere and storing carbon for more than 300 million years. When we cut down or burn trees and disturb forest soils, we release that stored carbon to the atmosphere. Since the start of the Industrial Revolution, one-third of all carbon dioxide emissions to the atmosphere from human activities have come from deforestation. To slow climate change, we need to rapidly reduce global emissions from fossil fuels, biofuels, deforestation and wetland and agricultural soils. We need to also accelerate the removal of carbon dioxide that is already in the atmosphere. In a new report published by the nonprofit Dogwood Alliance, my co-author Danna Smith and I show that we have a major opportunity to make progress on climate change by restoring degraded U.S. forests and soils..."
These People Want You To Know Climate Change Isn't Just for Liberals. Here's an excerpt from a story at Ars Technica: "...DeWitt sees his faith as fundamental to, rather than in conflict with, his concern about climate change. He often finds common ground with fellow evangelicals by talking about stewardship of the wonderful natural world they have been given as a home. Put in these familiar terms, climate change seems more like an issue worthy of careful consideration. Public opinion on climate change is, generally speaking, sharply divided by political and cultural identity. Research on this “cultural cognition” by Yale’s Dan Kahan has highlighted patterns of polarization around certain topics. We rely on our network of family, friends, and community for signals about what is true, and we feel pressure to harmonize our views with the views of that group. The more that political signals get tangled up with climate science, the harder it becomes for conservatives to do anything but reject it..."
Graphic credit: Climate Fingerprints. Climate science doesn't rest on a single, slender thread of evidence. There are multiple markers pointing to warming of the atmosphere, oceans and cryosphere. Spring's Early Arrival is a Troubling Indicator of Climate Change. Public Radio International has the story: "...She’d just been talking with the students about Henry David Thoreau, the naturalist, and conservationist whose classic book, "Walden," detailed his time living here at the pond. Primack explained to the students that about 17 years ago, he was trying to figure out a good way to measure the effects of climate change in the region. “And as I started looking, I heard about these records that Henry David Thoreau had made in the 1850s — from 1851 to 1858 — about when plants were flowering in Concord when birds were arriving in the spring and when trees and shrubs were leafing out,” he said. And since 2004, Primack and his students have been documenting the same things. “And so the information we have from Concord demonstrates that the warming climate associated with global climate change is already affecting the biology of the species here in Concord," he told them..."
Photo credit: "Richard Primack, here, is searching for newly leafing trees and blooming flowers near Walden Pond." Craig LeMoult/WGBH News. Washington's Broken Climate Debate. Axios reports: "Washington is a mess when it comes to climate change, split in two mutually exclusive groups of people: those who think the issue is the most urgent problem facing the world and those who refuse to acknowledge it's a problem at all. Why it matters: Dealing with climate change should be a priority for the U.S. government, but it's impossible with two sides that don't even agree on the terms of the debate. Congress hasn't seriously considered a climate bill since 2010, the last time any sizable group of congressional Republicans were willing to talk openly about addressing the issue. Meanwhile, outside of the beltway, concern about climate change is at record highs, according to a March Gallup poll..."
Image credit: Rebecca Zisser / Axios.